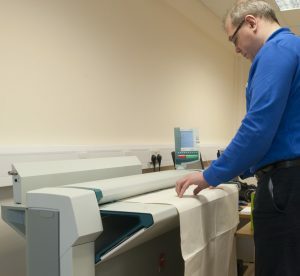 When you need documents scanned but are bigger than A3 size, such as large technical drawings and plans our Large Format Scanning services can help scan them in high resolution and then output as .pdf, .tif or .jpg digital files. Using our new Canon Oce TC4XT Large Format scanner we can efficiently scan any wide or big plans or drawings up to A0 width and any length – even up to 25 feet! See our case study for more details. Better still why not watch our large format scanner in operation.